As you toil away at your job, the promise of an after work drink is so enticing … a carrot leading you to the end of the day. 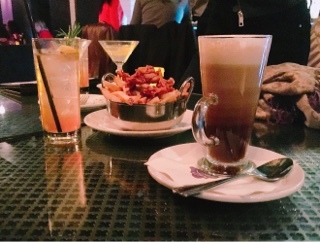 There’s no shortage of establishments across downtown Toronto that will supply you the drink, but to find a place that allows reservations, is cozy and friendly, and offers everything at reasonable prices is rare. Hence, when I first heard about East Thirty-Six two years ago, the promise of $8 martinis beckoned (regular pricing also included in this post). 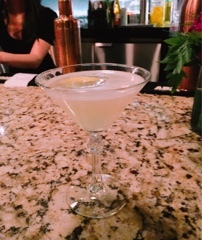 Every day from 4-7pm, you can head there for a cheap but still expertly made martini ($8) or mixed bar rail drink ($5). If you’d rather keep it simple, they also offer $5 pints. The St-Germain ($13) is my typical go-to cocktail with a gin base enhanced with St-Germain elderflower liqueur. The addition of sweetened lemon juice keeps it fresh while the cava makes everything light and bubbly. Meanwhile, if you enjoy gin and tonics, you have to try the Apothecary ($13). 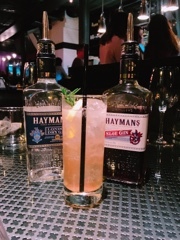 Combining two gins, the classic Hayman’s London dry and their sloe gin variety (steeps the liquor with sloe berries so there’s a vibrant red colour), the drink takes on a lovely pink hue without the use of overly sweet cranberry juice or grenadine. With a hint of rosemary mixed with lemon, I love the citrusy herbal flavours in the cocktail. As the cold weather begins, the Night Capp (spelling mistake intended) couldn’t come quick enough. 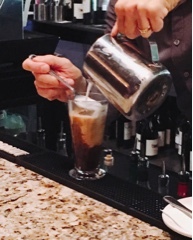 By combining coffee vanilla infused bourbon, macadamia nut syrup and a freshly brewed hot shot of espresso, before being topped with hot foamed milk, the drink separates into layers. You don’t expect the nutty macadamia flavour, but it works to add interest. 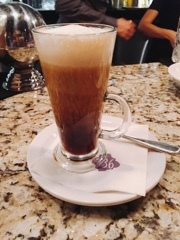 What a delicious concoction that’s perfect for something to warm you up or accompany dessert. East Thirty Six also has a great food offering. 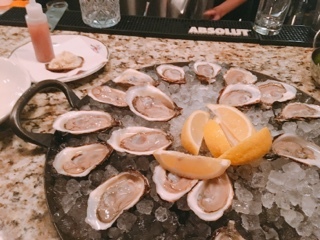 On Monday to Wednesday during 4-7pm, they also offer $1 oysters. The so called ‘buck-a-shuck’ is served with a vinegary mignonette and fresh horseradish. You can also add on some warm olives ($5) - plump and flavoured with citrus and garlic, to round out the snacking. Their fries ($6) are also fantastic, thick and potatoy hot from the fryer. 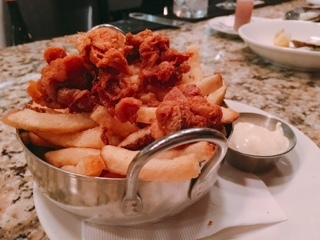 I could skip the extra calories that comes from the crispy chicken skin (a nice treat if you like pork rinds), but wouldn’t skimp on the creamy lemon aioli. 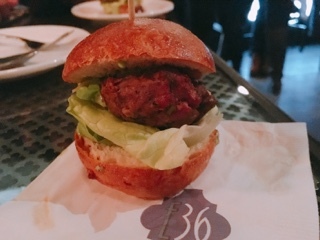 While sampling the new cocktails at their launch event, renditions of normal menu items such as lamb sliders, generally offered in a burger format ($16), was also served. It’s fantastic. The thick juicy patty slathered with ‘green goddess’ (a citrusy guacamole with an herb I can’t place), smoked onion and melted goat’s milk gouda. I could have easily gone for seconds but they were popular and quickly disappeared. 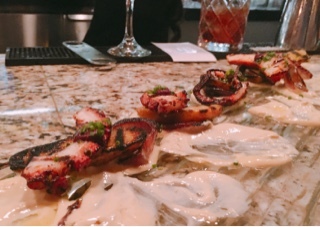 The octopus ($25) was meaty and tender; even the fingerling potatoes and onion getting some smokiness to meld into the seafood. 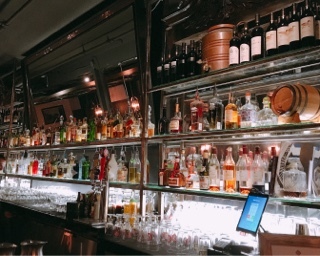 So as you go from meeting-to-meeting, plug away at a spreadsheet, or read that long boring document for the umpteenth time, just remember: the day is almost over and East Thirty-Six’s cocktail hour is just steps away.